Since my first forays into more interesting drinks I’ve been keeping an eye out for potato vodka. 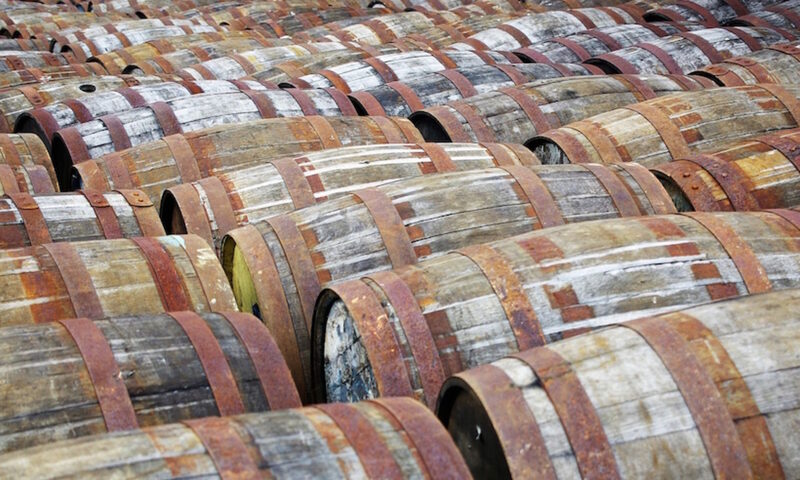 Partly due to its increasingly rare nature, partly due to the mention of potato based spirits in Robert Rankin’s books and partly due to my being intrigued by the concept of potato based booze. It’s not a big leap of imagination, with grains, rice, fruit and lots of other starchy things being regularly turned into alcohol, but for some reason the potato has stuck in my mind. So when my regular examination of the shelves in my local Waitrose (Westfield – one of their flagship stores, full of the more interesting end of their already interesting booze selection) yielded a bottle of British potato vodka I became intrigued. Finally this week, after a couple of months of occasional research, I bit the bullet, handed over some cash and bought a bottle – Chase Single Estate English Potato Vodka. Made by the people who used to be behind Tyrrell’s crisps, Chase (formerly Tyrrell’s) vodka is a small batch, British potato vodka made in Herefordshire with potatoes grown on the farm that is used to produce those for Tyrrell’s crisps. The internet seems to be slightly divided on the definitive timeline, but it seems that around the time that the original owner sold the Tyrrell’s brand he decided to branch out a bit and started making vodka. They also make another vodka from the farm’s apples (not an apple flavoured vodka, an apple based vodka – a clean spirit that just so happens to come from apples) which they also use as a basis for a recently released gin. It’s great what you can make with potatoes and apples. Potato vodka is not so common these days, with my researches suggesting that the main issue is one of cost, with potato based spirit costing more than the regular grain based products that are the basis for most vodka. 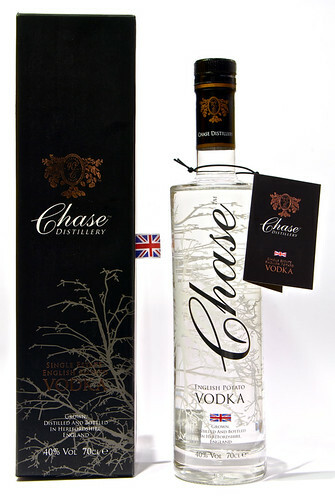 Chase is the only British potato vodka (although we do produce a bunch of other generally cheap and nasty white spirit that goes under the name of vodka from a variety of cereals and sugar products) and the comments out in the wild are not only about that uniqueness – they picked up the World’s Best Vodka award at the San Francisco World Spirits Competition back in March, beating 114 other vodkas submitted to the judges. I decided to taste it both at room temperature, as advised by the makers, and, as is more traditional, cooled down in the freezer. 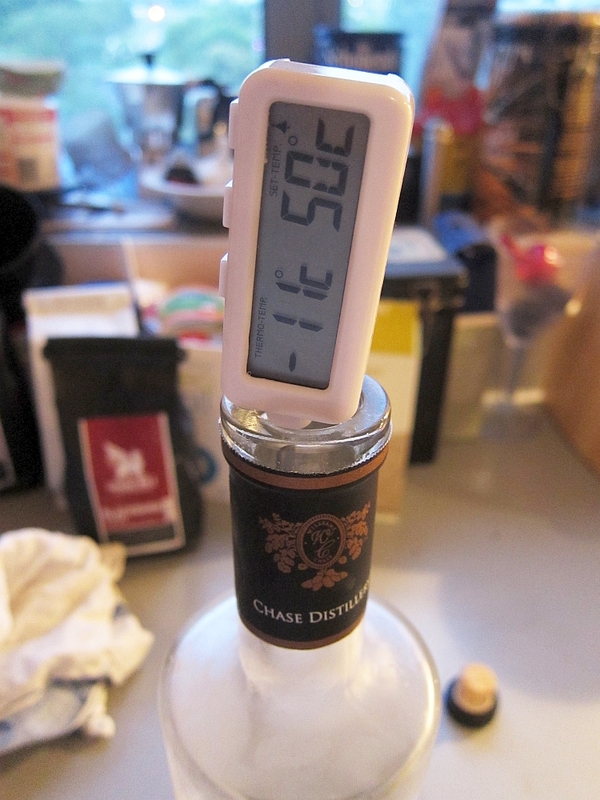 At room temp it has the traditional vodka smell, but without much of the petrol notes you get off of cheaper vodkas. It’s sweet with an underlying bitterness and a hint of liquorice. It’s smooth drinking, with quite a thick and sweet taste, a creamy feel and lots of the liquorice from the nose fading to a bitter finish, with almost woody notes down the sides of the tongue. Chilled down (to -18°C according to my slightly dodgy ‘probe’ – I tested it again this morning and it had hit -24°C. My freezer works much better than I thought – my first version of the picture to the left was at -4 and I almost stopped there) it still has a bit of nose, mainly just the hint of sweetness. In the mouth it’s much thicker, as you’d expect as it chills, and a lot of the taste has disappeared. The liquorice sweetness is still there and the finish is now clean, fading to general warmth quickly, with a buttery hint at the end. There’s still a creaminess, although more custardy now, and all in all it’s rather a nice package. It isn’t as flavourless as I’ve been told premium vodkas are meant to be, even when thrown down your throat in the ‘proper’ method of drinking, but it is creamy and sweet, has a short warm finish and overall actually tries to taste of something. I’d love to say that I can taste the potatoes, and many of the tasting notes I’ve seen on the web claim their flavour is in there, but I reckon that was cleaned out somewhere earlier in the distillation process. It’s got a nice chunk of flavour and I’ll hopefully savour the bottle that’s sitting in my freezer, although it might come out soon to warm and be served with a bit of ice. 40%. ~£30. Available in specialist shops and Waitrose.